I won't get into the bizarre story behind the red and white stripes of barber pole. Nor will I even bring up references like a jolly Santa or that classic color way on the vintage impala convertible. The mens lifestyle references I will bring up however is high school PE and clean mid 20th century modernism. The gang at Common Projects have a knack for creating clean pared down footwear that play the game of sneaker with the polished execution of a dress shoe. Their Vintage High sneaker for spring is no different. 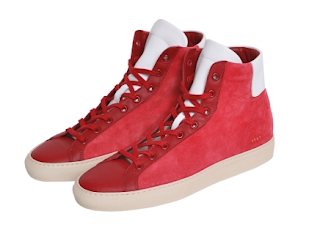 The toned down red together with the simple hi-top style evoke a high school experience the dad baby boomers may be familiar with and today's footwear enthusiasts can integrate into their dress up/dress down schedules. Available now at select Common Projects retailers as well as SSense.com and RSVP Gallery.